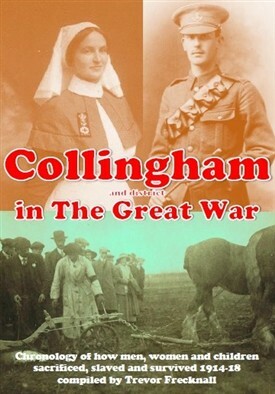 The images on the cover are: Betty Hunt, a nurse who died from appendicitis while tending thousands of wounded troops at a Kent Hospital; Bertie Colton, the heroic stretcher-bearer; and May Bocock, who proved farmers were wrong to believe mere girls could not control cart horses and plough the land. More than 80 people attended the launch of Collingham and District in The Great War, a 65,000-word, 160-page chronology compiled by Trevor Frecknall, the author of Newark in The Great War. It was launched on Tuesday 15 September 2015, the 100th anniversary of a day that symbolised how the villagers sacrificed, suffered and slaved from 1914-18. On 15 September 1915, Collingham Boys’ School was closed by an outbreak of scarlet fever; women and children as young as 12 were being urged to work in the fields so that more men could volunteer to join the Army; and news arrived of the death of Bertie Colton. Only 21, Bertie had been born at Brooklands, North Collingham; educated at the Magnus Grammar School, Newark; become a leader in the new Boy Scout movement; and worked for Edward Bailey’s estate agents in Newark. As soon as War was declared, he enlisted in the Sherwood Rangers Yeomanry and became a stretcher-bearer in the fated Gallipoli Campaign, which was intended to open a “back door” to Germany but ended in utter failure. Bertie was shot after rescuing up to 34 wounded men from burning gorse as the Turks rained shells down onto the exposed Allied positions. His mother Minnie – who had been widowed just before Christmas 1914 – defiantly continued to run a voluntary hospital for wounded soldiers in South Scarle Hall even after her other son, Stanley, was killed in 1918. Only 19 years old, he had already won a Military Cross for a grenade attack on German trenches before he was shot by a sniper. The Coltons are one of more than 400 family names to appear in the book, which charts the parts played, voluntarily and reluctantly, by residents of Brough, Girton, Holme, Langford and the Scarles as well as North and South Collingham ... going to War, winning bravery medals, losing lives; staying home, fearing invasions and Zeppelins, working all hours; going to school, taking time off to work on farms, struggling to survive epidemics. Copies of Collingham and District in The Great War signed by the author are available from Trevor Frecknall, 9 Main Street, North Muskham, Newark, Notts NG23 6EZ, for £12 including post and package in the UK. Please make your cheque payable to T and GM Frecknall. This page was added by Website Administrator on 21/09/2015.